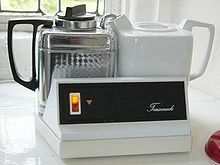 A teasmade is a device for making tea automatically, which was once common in the United Kingdom and some of its former colonies. They generally feature an analogue alarm clock and are designed to be used at the bedside, to ensure tea is ready first thing in the morning. Although crude versions existed in Victorian times, they only became practical with the availability of electric versions in the 1930s. They reached their peak in popularity in the 1960s and 1970s, but have since declined to the extent that in the few places they are sold new, it is as a retro novelty item. The name teasmade is an example of a genericized trademark; Goblin were the first to market their teamakers under the name teasmade, it is now commonly used to refer to any automatic teamaking appliance. Teasmade is a registered trademark for Swan. 1978 advert for Kelloggs Cracklin Bran . 1991 commercial for Kelloggs CoCo Pops. The cereal is known as Choco Krispis in Portugal, Mexico, the Dominican Republic, El Salvador, Costa Rica, Honduras, Guatemala, Panama, Colombia, Venezuela, Ecuador, Peru, Bolivia, Brazil, Chile, Paraguay, Uruguay, and Argentina, and Choco Krispies in Spain, Germany, Austria, and Switzerland. It was introduced in the United Kingdom as Coco Pops in 1961, and is also known by that name in Denmark, Bulgaria, Ghana, Malta, New Zealand, Ireland, Finland, Italy, Greece, Sweden, Israel, France, Belgium, the Netherlands, South Africa, Kenya, Uganda, Botswana, Hong Kong, Lebanon and Australia. Later in the 1960s, the name was changed to “Coco Krispies,” but subsequently reverted back to Coco Pops. In 1998, the cereal was briefly renamed again in the UK, this time to Choco Krispies. However, in 1999, after falling sales and a telephone poll in which the British public voted, its name reverted back to Coco Pops. The cereal was known as Cocoa Krispies when it was marketed in Canada, but it is no longer distrusted there.